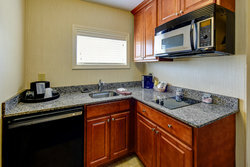 Particularly suited for our extended stay guests, this King with Kitchenette studio is a great option for anyone who enjoys the luxury of cooking for themselves during their stay. 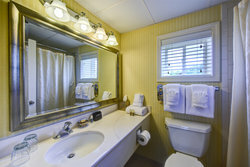 Our kitchenette studios are complete with full kitchens and gorgeous in-room amenities for a comfortable stay in Portsmouth. Within your own private kitchenette is a stove, microwave, mini-refrigerator, sink for washing dishes, and all the cooking utensils and pots needed to cook a delicious meal. Make yourself truly at home with all of your favorite recipes, whipped up right in your room. 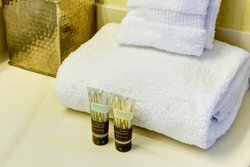 Our property is uniquely suited to accommodate extended stay guests with on-site conveniences like laundry facilities, a business center, and more. 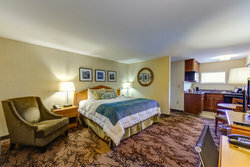 Tuck in for a restful night’s sleep in this room’s spacious king bed with luxury linens and plush pillows. You will also appreciate a wealth of in-room comforts like high-speed Wi-Fi and a flat-screen television with premium channels. Bringing the dog? You will love the proximity of these rooms to the nearby dog walking area, located just behind our hotel. Plus, you will enjoy your easy access to the picturesque outdoor pool, as well as the BBQ area. Included in every night’s stay at The Port Inn is a delicious complimentary breakfast, high-speed Wi-Fi, premium bath amenities, and more!